How to Choose The Ideal Cage for Your Parakeet – It is important to buy the right cage and provide maximum comfort to the bird. Dogs and cats are the main pets in your homes, but not everyone can create these animals. Thinking about it, birds can be a good alternative for those who wish to have a friend of the animal world at home. Among the species, the parakeet is the most chosen among the people. The parakeet is a bird of the same family as the parrot, although it is much smaller. It lives for quite some time, about 15 years, and is found in a large range of colors (except red and black), being able to be born monochromatic or polychromatic. If you are thinking of buying a specimen, know that parakeets love company, so it is common to buy them in pairs, although it is not a rule. It is quite possible to have a single bird and he will live quietly. In case of pair acquisition, it’s okay to put two males in the same environment, but two females is not a good choice. They fight continuously since they were young. Before you decide to have a parakeet, it is important to know the answer to that question: which cage should I buy? Each type of bird fits best to one type of cage, so it should choose the ideal one. The bird will remain inside it for the rest of its life and it is the owner’s obligation to provide the best to the little animal. First of all, it is necessary to know the bird. The characteristics are responsible for determining the ideal habitat type. In the case of parakeets, they are very agitated, they love jumping from one perch to the other and giving mini flights through the cage. On the other hand, its size is small, so the environment does not need to have extreme dimensions. A cage, for any bird, must be at least a size that allows the animal to spread its wings without touching the sides. For budgies, this rule also counts. In the case of this species, the cage should be large and preferably twice its size with the wings open. The hectic personality demands a great environment, especially if more than one parakeet is created in the same place. 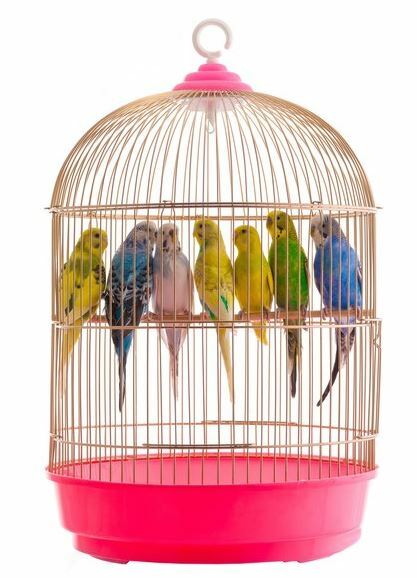 Regarding the format, never buy round cages because the bird loses the notion of space. This can be detrimental to health. Opt for square or rectangular, more suitable for the species. If you choose for a nursery, the same tips are worth it. Do not buy those made of wood, as there is a great chance the bird will gnaw at the grids and flee. Prefer metal ones, which are more resistant and also hygienic. Although it already comes in cages and nurseries, they are not always suitable for parakeets. The perches that come together are smooth and thin, little indicated for the species. This model can cause osteoarthritis in the future or else they can eat pieces of wood because it has the habit of pecking and plucking. The ideal is thicker, irregular perches with deformities. They are known as natural perches because they mimic tree branches. Opt for the made of non-toxic wood or reuse parts of trees to imitate the object. The parakeet can live on top of the perches that come in the cage, but if you want to provide greater comfort and habitat closer to the ideal, it would be interesting to get the natural perches. Put them in the cage so that the bird can fly at a good distance, but do not stick it on the side grids, as the tail feathers can rub against the wire when they land and that will leave them looking ugly. It is not very secret to choose the feeder and drinkers of the parakeets. Ideally, they are plastic or metal as they are easier to clean and lessen the chances of disease spreading. The same tip applies to the bath bowl. They can stay outside, this prevents birds from getting the water dirty or wasting food from the pots. Water from the drinking fountain and bathtub water need to be changed every day to prevent bacteria from accumulating and disease development. The food also needs to be renewed regularly so it does not spoil or get dirty from the stool. If you want to entertain the birds, a good option is to buy toys and put in the cage. Parakeets love to climb, gnaw, sway and hang. It is important to consider buying toys because they avoid stress and boredom. The objects distract the animal when the owner is not around and have fun alone. Just like a dog or a cat, birds also like entertainment and distraction. At the time of purchase of the cage or nursery, it is important to be attentive to some details to provide security to the parakeet. Check out the space available at home where you want to leave it. The place needs to have the ideal cage for the bird. See if there are no sharp corners or pieces of metal that could hurt you or the animal. Take all of these tips into consideration when purchasing a parakeet. It is important to ensure the best environment and maximum comfort to the bird.